Mary is the first Christian and the first evangelist. Her crowning as Queen of heaven is foretold in Psalm 45, which states that her name shall be known in all generations (like in Luke 1:48). Where Mary is, there is the Holy Spirit, as the two were one flesh, and are now one spirit. Only Mary proclaims herself blessed in the bible, besides God. In Luke 1:48, we are commanded to call her blessed by God, as she is no ordinary woman. The first words of salvation (the announcement of the savior promised in the OT) were addressed to her by an angel sent from God. Gabriel's first word to her was "Hail", which is a royal term, as in "Hail Caesar", or "Hail King of the Jews." And Gabriel didn't speak this on his own: He spoke the words God told him to speak. In the Latin Vulgate, the first edition of the bible published in the vernacular of modern man (St. Jerome translated the Hebrew/Greek edition of the Bible into Latin in the 4th Century), it plainly says that Mary is FULL OF GRACE, not a "highly favored daughter." The Latin term "Ave gratia plena" means "Hail Full of Grace," and not anything else. What "Full of Grace" means is that there was, and is, no stain of sin in Mary, because the original Greek term, "kecharitomene," has the connotation of "you who have been filled with grace." Therefore, there was, and is, no room in Mary for sin (A glass that is full to the brim of pure water has no room in it for dirt). Which is why the Church believes in the dogma of her Immaculate Conception. Mary says that her soul (which is still very much alive, as all souls are) MAGNIFIES the Lord (Luke 1:46), which makes Jesus clearer, larger, and more focused in our lives (and that's a GOOD THING!). And like a magnifying glass, looking at Jesus through the lens of Mary can start a fire on earth, if we focus her just right (and that would be to adopt her as OUR mother, as Jesus said in John 19:27). After all, Jesus said that he came to cast fire on the earth (Luke 12:49), and Mary is the mechanism which He has chosen to do that with. Jesus came to us through Mary; we should go to Jesus through her as well. If you look at the palm of your hands, most people will see an "M" on them. God has branded us all with Mary's initial. In Luke 2:19, scripture says that Mary pondered all these things about her Son in her heart. When we say the rosary, we imitate her in pondering the life of Christ. A good mother feeds her kids, cleans them up, and teaches them virtues. Mary feeds us by leading us to the Eucharist, cleans us up in the sacrament of confession, and teaches us right from wrong, so that we always will be true to the faith. During Eucharistic Adoration, Jesus, in the form of the consecrated Host, is held by the monstrance. The monstrance symbolizes Mary, who held the baby Jesus while the three Wisemen adored Him. And we should also be like wise men and wise women, by adoring Christ as often as possible in Eucharistic Adoration. When the Holy Spirit impregnated Mary with the Son of God, it meant that Mary is not only one flesh with Christ, but also one flesh with the Holy Spirit. In other words, since Jesus is God, therefore Mary is the Mother of God, and Jesus is NOT the illegitimate Son of Mary. Jesus is every bit as much the Son of Mary as He is the Son of God. To think otherwise would make Jesus into a "b*****d," and no one in his right mind should ever think this. The bible says in Luke 6:43 that a bad tree cannot bear good fruit, and Elizabeth said in Luke 1:42 that Jesus is the fruit of her womb. 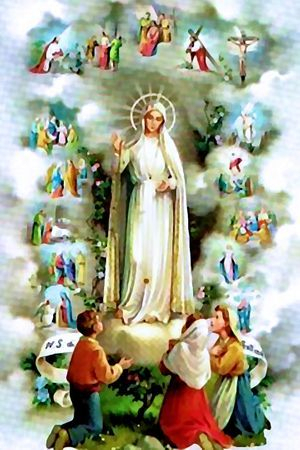 Therefore, Mary has to be pure and holy as well as Jesus. Mary brought Jesus into the world physically then and spiritually now. Mother and son exchange cells in their body upon conception, in a process known as fetal cell microchimerism. Therefore, Mary has cells of Jesus in her, which is one reason why satan hates her so much. Truly, Jesus is bone of her bone and flesh of her flesh. Jesus, through His last will and testament, gave to mankind his most precious possession, His mother, when he said while dying, in John 19:27: "Behold your mother." The scripture says that Jesus addressed this to his DISCIPLE, not to "John," and not to his "apostle." Therefore, since these words are addressed to His DISCIPLE, and we are all disciples of Christ, that means His words apply to us all, and not to just the APOSTLE JOHN. We have a covenant relationship with Jesus (this is why it's called the “New Covenant”). A covenant is a uniting of unrelated people into a family bond by taking an oath before God. This happens in an earthly fashion in marriage and adoption. And like it or not, we always get the mother-in-law in a marriage. Since Jesus declared himself the bridegroom in the New Covenant, that means we get Jesus' whole family, including His Father AND His mother, which is much more than a personal relationship. Mary is the new Eve. Mary, an immaculately created virgin, said yes to the spirit Gabriel allowing salvation to enter the world, and giving us the Eucharist to eat, the source of eternal life. As opposed to Eve, the first immaculately created virgin, who said yes to the spirit Lucifer, allowing death to enter the world through eating forbidden fruit. Jesus came out of Mary, Eve came out of Adam. Mary's intercessory power for our needs comes from the Bible, in John 2, where she intercedes for the bride and the groom to her son Jesus. She interceded to get Jesus to make new wine. Her last recorded words in the Bible are "Do whatever He tells you," which would be her same words to us today if she were to converse with us. Mary is not some stand alone goddess; she is the most powerful intercessor to Jesus in the universe for our requests. Mary is the woman in Genesis 3:15 at enmity with Satan, which we see come to fruition in Revelation 12. The devil cannot defeat her because of her Immaculate Conception, and her sin-free life. God has empowered Mary, “the Woman,” to defeat satan, because satan's pride is hurt more by being beaten by a human than by Almighty God. Mary is the Queen Mother. Starting with King David, all Jewish Kings had their mothers for Queens, since they had so many wives (but only one mother). The Gebirah in Hebrew means “Great Lady.” “Geber” is the root word for Gebirah, and it is the same root word that Gabriel comes from, which has the connotation of “warrior.” According to 1 Kings 2, the Queen Mother sits at the King's right hand, and the King bows down to her and does not refuse her requests (like at the wedding feast at Cana). Proverbs 31 outlines the words of the Queen Mother of King Lemuel. Mary is crowned Queen in Revelation 12. Mary is the Ark of the New Covenant. The OT Ark had the Word of God in stone inside of it (the tablets of the Ten Commandments), a jar of the bread from heaven, “manna,” as well as the rod of Aaron, which symbolized the royal priesthood (a dead stick which resprouted and came back to life) . Mary had the Word of God in flesh inside of her for 9 months, as well as the bread from Heaven (the Eucharist), and Jesus is the royal high priest. Luke 1 is a direct parallel to 2 Samuel 6, where Mary arose and went into the Hill Country (David arose and went to Jerusalem); at the sound of Mary's voice, John the Baptist leaped for joy in Elizabeth's womb (David danced before the Ark); Elizabeth said “How is it that the mother of my Lord should come to me (David said “How is it that the Ark of the Lord should come to me? ), and Mary stayed in Elizabeth's house for 3 months (The ark stayed in the house of Obed-Edom for 3 months.) In Revelation 11:19, St. John says that he sees the long lost Ark of the Covenant in heaven, and in the next verse, he describes the Ark as "A woman clothed with the sun," or Mary. Mary is like a star in 3 different ways. Like the star of Bethlehem, she also leads us to Jesus. Like a star which is burning hot, Mary is on fire with the Holy Spirit. Like a star, Mary is the most famous woman of all time. Matthew 18:3 says that unless we become like little children, we can't enter the kingdom of heaven. What do all little children have in common? They all love and obey their mother. The sun shining bright in the blue sky is a symbol of the light of Christ shining through to us through Mary's blue mantle. The white clouds overhead symbolize the shekinah glory cloud that overshadowed Mary in Luke 1:35. Jesus is like the sun, giving off life-giving sunlight. Conversely, Mary is like the full moon, fully reflecting His light onto a very dark world.